Tuesday is Trivia Night at the Old Post in South Burlington, a bar that opened under new ownership last fall on Queen City Park Road. Competitors at a recent showdown were in luck if they could connect sports teams and the occult (think Orlando Magic) and if they had a knack for quirky wordplay (use a cuspidor if you're spitting in Portugal). A sweeping knowledge of popular culture — from the movie Some Like It Hot to the band Blood, Sweat & Tears — also came in handy the night two friends and I joined the game. But one question, in the category of local history, would likely stump almost everyone playing trivia at the bar: Who opened what is thought to be the first tanning salon in Vermont? 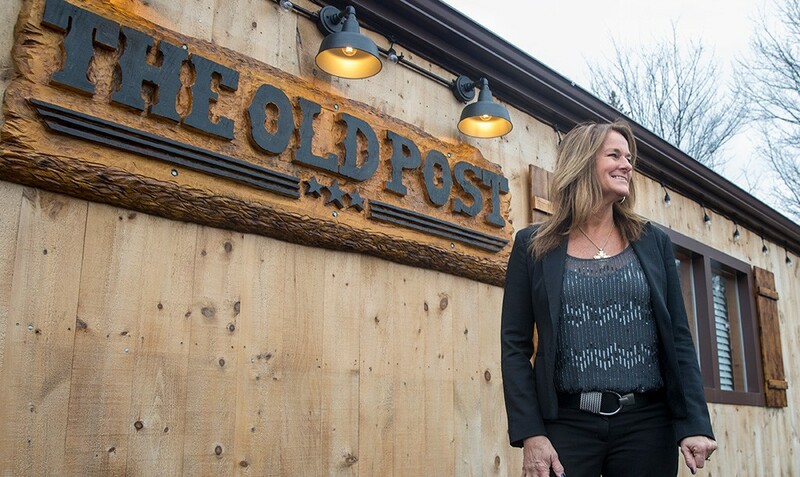 The answer is Kim Rouille, the current owner of the Old Post. In 1984, when she was 18 — back then, her last name was Keppler — the Rice Memorial High School graduate wanted to own and operate her own business. Rouille's wish was almost crushed when bank after bank turned her down for a loan. Finally, she recalled, an officer at Howard Bank said he'd give her a shot. "But you make sure you do it right," he told the teenager. "You pay off that loan." Rouille, 51, opened Tanfastic at the Ethan Allen Shopping Center, and her top priority was paying her debt. "I wanted to make him proud," she said of the banker. "He gave me a chance." She paid off the loan early and ran the salon for 16 years. After raising a family and learning to bartend, Rouille has started her second business. 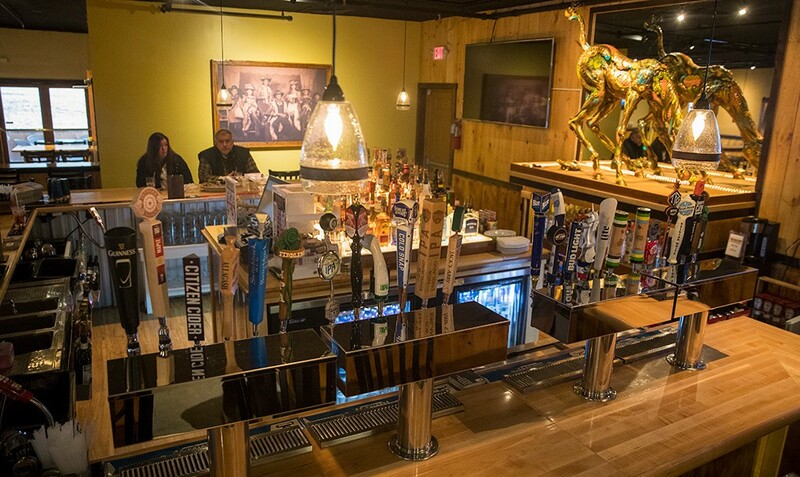 The Old Post opened in early November in the rustically rebuilt space that for years housed Franny O's and, more recently, the Sugarhouse Bar & Grill (which closed last summer after it was shut down by the Vermont Department of Taxes). "This came right out of the blue," said Rouille, who previously tended bar at the Fraternal Order of Eagles club. "I heard that the building was empty, called the landlord and met with him. It was intuition. I went on a whim." Her contractor husband, Dennis Rouille, renovated the barroom with upscale simplicity and a wooden motif — blond bar, high tables, a pool table on one side of the room and a stage on the other. 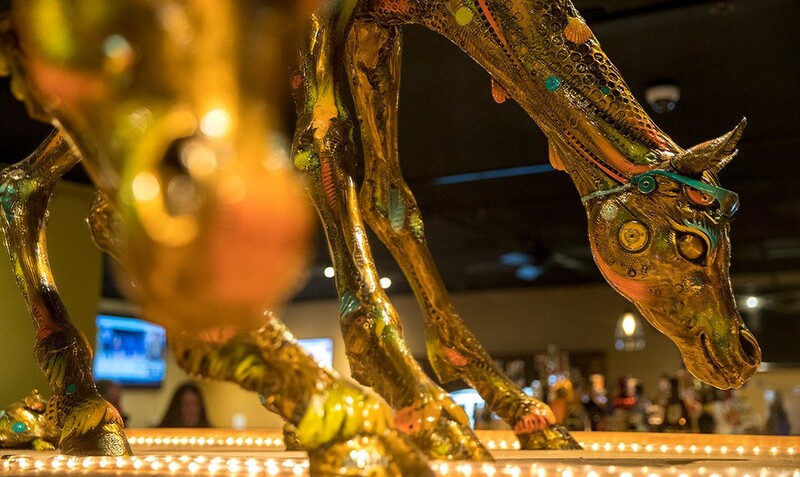 The centerpiece of the room is a 600-pound bronze horse that dazzles from behind the bar. It is studded with jewels, medallions and other decorations that hold personal meaning for the family. The Rouilles met the artist, Nano Lopez, on a cruise to Antarctica several years ago and commissioned a piece with one request: that the horse be adorned with a deer head, which the artist placed at the sculpture's tail end. On the cruise, at a stopover in the Falkland Islands, Lopez spent the day looking for branches from which to craft the antlers, Rouille said. The horse was in her South Burlington garage until she opened the Old Post and gave the beast a home. By the bar's front door stands another animal sculpture: a bear and her cub in the hollow of a tree trunk, carved with a chain saw by Waterbury sculptor Charlie O'Brien. Adorning one wall is a black-and-white photo of Rouille and her family (her three kids and Dennis' two) decked out in Western attire. Rouille is at the Old Post every day, tending bar several times a week. She announces her presence in the parking lot, where her black Hummer has vanity plates that read MRSRULE. Inside, she rules with a warm and inviting manner — mixing drinks, popping open beer bottles, planning special events and keeping the conversation going. "I've just been having a ball," Rouille said. "It's been so much fun." On tap, the Old Post has a mix of New England craft beers, plus old favorites such as Pabst Blue Ribbon, Labatt Blue and Bud Light. Being a bartender "is about the interactions, the hugs," Rouille said on a snowy Sunday afternoon as she poured me a strong Bloody Mary spiced with horseradish and garnished with olives. "It's about seeing people all the time and hearing their stories," she continued. Rouille encourages people who are upset to "Let it go. Don't hold it in," she said. "You listen to them, and life goes on." The bar that afternoon was ringed by a group of men, with only one female customer among the 15 or so patrons. Laura Schiele, 26, who works at Dealer.com and lives in the neighborhood, said Rouille has created an inclusive and welcoming environment. "The first time she gave me a hug, I don't think we'd said a word to each other," Schiele remembered. "If you want to sit and do your own thing, everybody's going to be respectful of that. And if you want to socialize, there's a space for that, too." Playing trivia at the Old Post is an appealing combination of doing your own thing and socializing. Team members converse among themselves to answer the questions, but each team is also part of a larger group that has a common focus when the MC reads the answers. A can or two of Citizen Cider, we found, can inspire (or diminish) the recall of useless information lingering in the recesses of one's mind. Who was that figure-skating champ from decades past? What movie ends with the line "You met me at a very strange time in my life"? I stepped away from our little team of three to meet a few of our competitors. Katherine McGrath, a nurse in the general medicine division at the University of Vermont Medical Center, was enjoying her night off by eating hog wings and playing trivia, plus shooting a little pool for good measure. "Even though I don't know half the answers, it's just fun," McGrath said. "It's better than sitting around watching Netflix all night." One of her teammates was her fiancé, Kyle Chamberlain, a bartender at the Old Post. "I feel like these questions are way above my pay grade," he joked. At the bar, where another team convened, Jenny Millan said she's a competitive person who likes "random facts and learning more things." She teaches in an after-school program in South Burlington, and she told me a bit of her own family trivia: Her father had been a roadie for the Rolling Stones, the Beach Boys and Bonnie Raitt. When our team managed to eke out victory, we were happy to share some of our loot — a black Boston Bruins sweatshirt and a pair of white plastic shades — with the other players. It was the kind of barroom camaraderie that seemed in keeping with Rouille's rules. The original print version of this article was headlined "A Hang for the Hood"